Earlier this week we had a one-day warm front come through. The day before had been around -14°C (7°F), and the day following was only a degree or two warmer. But that day it was 2°C (36°F) – balmy! It seemed like a perfect opportunity to take a jaunt over to the 100-acre woods and mosey about. I didn’t need my long johns, or my second toque, or my inside vest, and my mittens remained stuffed in my pocket most of the time. It should’ve been a really pleasant outing. The problem was, I hadn’t accounted for the above-freezing temperatures making the snow heavy and wet. I wore my snowshoes, because the snow was just deep enough that I’d be disinclined to hike off-trail without them (and the 100-acre woods is all, pretty much, off-trail). And found their first (and to-date only) flaw: the built-in crampons on the underside of the snowshoe were spaced just perfectly to pack in and hold the wet snow. In half a dozen steps I had large snowballs underneath each foot. 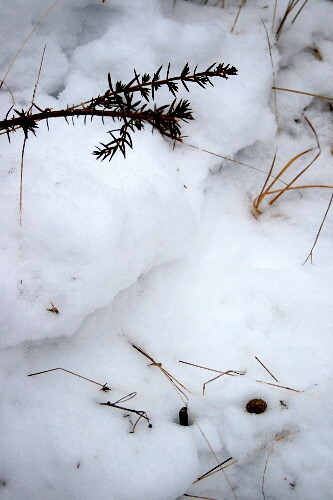 It was nearly impossible to walk on the packed trail, and even in the loose snow my feet would plant at funny angles. I thought this simply annoying at first, but soon felt otherwise. It’s roughly 1 km (0.6 mi) from our house to the entrance to the 100-acre woods. By the time I reached there, I had blisters forming on the backs of my heels from rubbing unusual spots in the boots. I discovered that our neighbour, who maintains the trails in the woods, had been through recently on his ATV; I took my snowshoes off, limping the 2 km through the woods and back to our house along the packed snow of his tracks. I didn’t do much nature observation. But the weather was nice. The one thing I did notice was at the foot of our 30 acres, before the blisters had gotten too bad. It was the above scene. 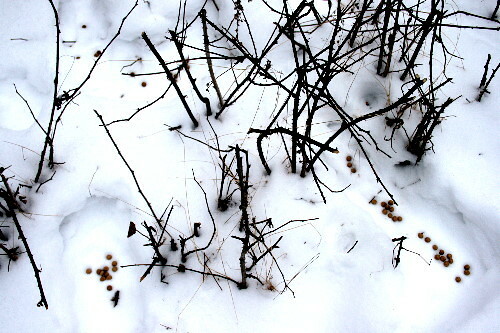 In a patch of brambles, there were several long, narrow depressions in the snow, most of them filled with bunny droppings. (The contrast in the photo is increased to emphasize the tracks). Snowshoe hares, by default; I have yet to notice any evidence of cottontails around here. The long depressions suggested they’d paused in the one spot for a while; the droppings that they’d perhaps hopped forward slowly as they left the depression. I bent down to investigate more closely. 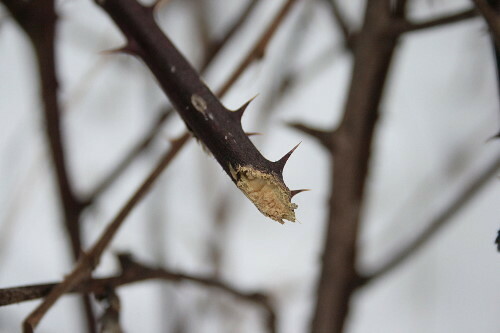 And that’s when I noticed that many of the twigs had been snipped off at the end, sheared cleanly by sharp teeth. Obviously the hare(s – I couldn’t really tell if there’d been only one or if there were more, though hares are usually independent) had dallied here browsing. I was rather surprised by this. While I know that in the winter, when tender greens are scarce, hares will turn to twigs and evergreen needles for food, I thought there surely must be easier plants to target than the prickly stems of brambles. 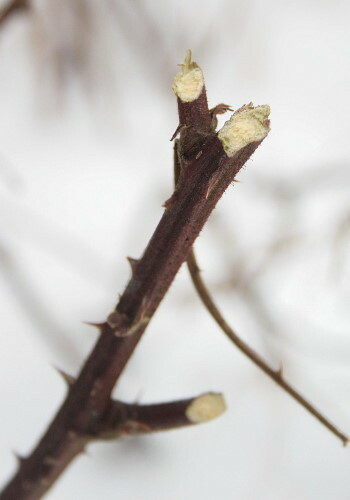 Quite a few of the stems were nibbled, so the hares must have found them tasty. I wonder how they keep from getting poked in the mouth as they eat? A short distance away I found a couple more depressions alongside a juniper bush. 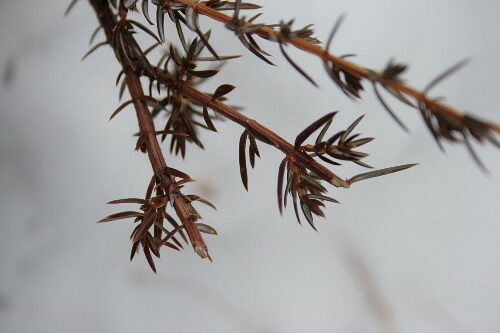 The tips of many of the juniper twigs were also trimmed off. This didn’t surprise me nearly as much as the brambles; although the junipers are pretty prickly, as evergreen needles go, they’re not the same sort of sharp as the needle-points of the bramble thorns. It was interesting to see this evidence of the hares feeding. Ordinarily I see many tracks, criss-crossing back and forth through the forests, forming well-trod highways, but they’re always going from somewhere to somewhere. This was only the second time I’d noticed them spend any time in a spot, and the first time hadn’t looked to be for feeding.